The month of June should be a time of planning and preparation for the busy harvest season that lies ahead. This article is for our country’s valued subsistence farmers. Subsistence farmers produce crops on smaller areas, usually 0,5 ha - 5 ha. Harvesting is often done by hand whereby cobs are picked and stored until fully dry. Once dry, cobs are threshed or shelled, removing the pips from the cob. Harvesting by hand can present many challenges. In this article we will discuss some of these challenges and strategies to overcome them. In our communal setup, one of the biggest challenges is early harvesting before the maize is fully mature. So why do farmers harvest too early? Usually it is due to damage caused by communal livestock which start being herded into the arable fields in the winter where there is still abundant grazing. This poses a big challenge as the farmers maize is not yet ready to harvest. 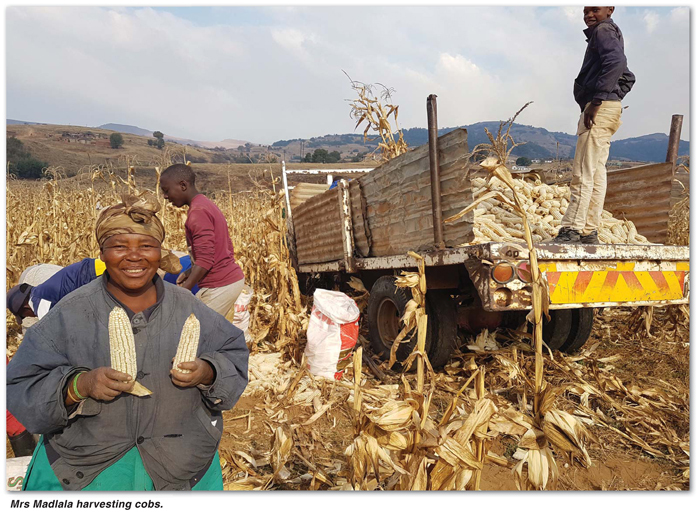 Farmers are then forced into a situation where they have to harvest early and store their cobs at their homes in order to prevent huge crop losses caused by the livestock. This is a serious problem due to the fact that maize loses weight as it was harvested early and pips did not have sufficient time to mature and fill completely. It also opens the door for the occurrence of rotting due to high moisture content which can result in mycotoxins in the maize. Pests can also have a devastating effect when maize is stored at home. What can we do to prevent these losses? Firstly, we can discuss the issue with the tribal authorities and regional counsellors. As crop farmers you need to go as a united group to express your challenge and request for an extended period before livestock is allowed into the communal arable fields. This will give maize more time to mature and dry on the field. Secondly, farmers should try and do all that they can to keep cattle out by guarding their crops at all time. An ever-present farmer is a successful farmer. If these attempts fail and you have no other option but to harvest early you need to take measures to store maize cobs in the best possible manner. How to store your maize cobs for drying? Traditionally subsistence farmers have made use of a ‘Nqolobane’ which is a cob cage structure. It allows air to pass through the maize cobs from the sides and from the bottom. With the movement of air through the cobs one can prevent rotting. This method works well. I have however noticed fewer farmers using this traditional method. They rather store maize in a rondavel hut or even just in a pile on the ground outside covered with a tarpaulin. This needs to be changed. Maize cannot dry sufficiently and there are huge losses due to rotting cobs. This rotten maize is unsafe for human and animal consumption as there will be hazardous mycotoxins present in it. Wet maize cobs should be stored in a dry place where air can move freely through the cobs. The farmer needs to take measures to prevent damage by rodents and other pests. Cobs should also be moved or agitated every two days so that all cobs get equal exposure to air. Cobs can be threshed effectively only once moisture content reaches 14% or lower. It is unsafe to try and store anything over 14% moisture. If you are unsure of the moisture content you should take a sample to be tested at your nearest co-op delivery depot where they have machines that can test the moisture. If this is not possible, one can do a ‘home test’. If you take a cob in your hands and twist, the pips or kernels should pop off the cob with no effort at all. If the pips are tight and difficult to pop off the cob and if they squeak in your hands, this means that they are still too wet and need to dry for longer. I encourage all small-scale farmers to take the following measures when getting ready to harvest their maize cobs by hand. Make sure that you have a good storage facility erected before you start harvesting. Even if it is a make-shift structure. Make sure that air can move through the cobs and that it is protected from the elements. Once cobs are in storage, be sure to agitate and move the cobs around every two days. This will reduce your drying time as well as the occurrence of rotting. Make sure that cobs are sufficiently dried before you start the threshing process. Store shelled maize in a secure, dry room. If you plan on storing the maize for some time it is a good practice to fumigate the maize with fumigation tablets and cover the bags with a tarpaulin. Remember that every little effort that we make can make a big difference on the quantity and quality of maize that we produce and harvest. When prices are low as they currently are, all these factors can make a big difference when it comes to profitability.